Meet the most fantastic troupe ever to wander on to an American stage! Mini-Mud, Mini-Brian & Mini-Gwin delight capacity audiences daily, yet they don’t get a single red cent for any of their work! Hurrah! 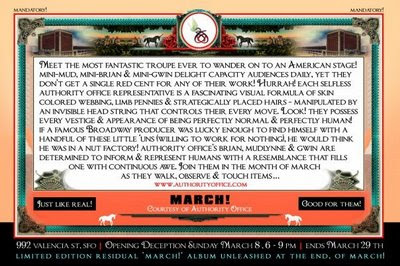 Each selfless Authority Office representative is a fascinating visual formula of skin colored webbing, limb pennies & strategically placed body hairs - manipulated by an invisible head string that controls their every move. Look! They possess every vestige & appearance of being perfectly normal & perfectly human! If a famous Broadway producer was lucky enough to find himself with a handful of these little ‘uns (willing to work for nothing), he would think he was in a nut factory! Authority Office’s Brian, Mudlynne & Gwin are determined to inform & represent humans with a resemblance that fills one with continuous awe. 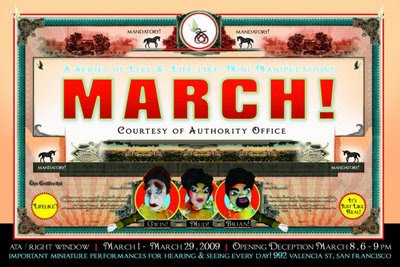 Join them in the month of March at San Francsico's ATA/Right Window Gallery as they walk, observe & touch items.